I’m an awful baker. I’m trying to get better by baking a new recipe every Sunday. 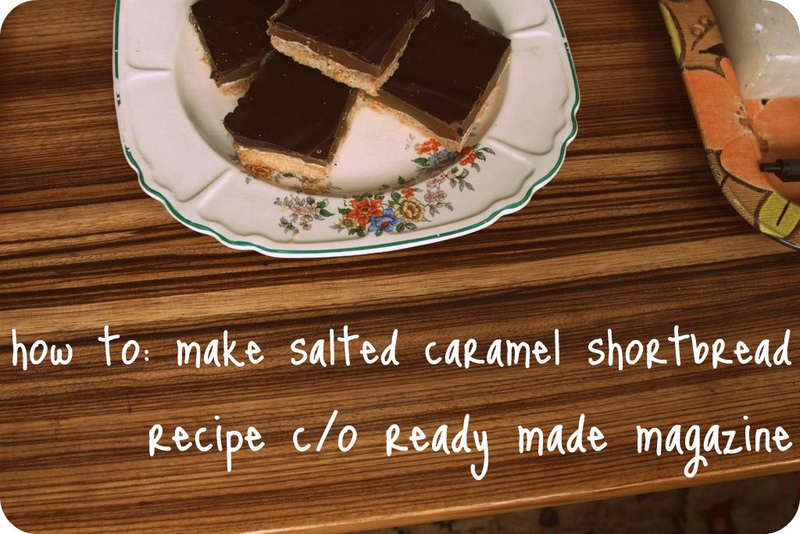 After two weeks of epic fails, finally…success in the form of salted caramel shortbread! This recipe alone was reason enough for me to plunk down $6 this week and subscribe to Ready Made magazine. The finished result is insanely yummy, but even more than that, if I can bake this without screwing it up, so can you. A few words of warning: You’ll need a good chunk of time to make this, as there is quite a bit of waiting in between some of the steps. 1. If you’re lucky, mix the shortbread ingredients together in a food processor. Or, do it the traditional way by sifting the dry ingredients in a large bowl, adding the butter, and using clean fingertips to rub them together until a dough forms. Form dough into ball (it’ll be super crumb-like), cover with plastic wrap and put in fridge to rest for an hour. Meanwhile, line a 9-inch square brownie pan with aluminum foil or parchment paper and preheat the oven to 325°. Flatten the rested dough into the pan. 2. Prick the top of the dough all over with a fork and bake for about 40-45 minutes, until the top is light brown and starting to come away from the edges of the pan. Allow to cool in the pan for at least one hour before you make the caramel. 3. To make the caramel, put the sugar and cream in a heavy-bottom saucepan set over low heat. Heat gently, sitting with a wooden spoon as it comes to a boil. Bring the caramel back to a boil and let it bubble gently for 5 minutes, sitting occasionally. Take the caramel off the heat, add the salt and stir vigorously to ensure that it is thoroughly mixed in. Then, working quickly, pour the caramel on top of the cooled shortbread. Put the pan in fridge (or, if you live in Minnesota, your porch) and let set for at least 1 hour. 3. Once the caramel has set, melt the chocolate over a double boiler. (If you want to temper it properly, here are the directions for how to do that.) Pour the melted chocolate on top of the caramel and spread it evenly with a rubber spatula. Allow the chocolate to set before lifting the shortbread out of the pan and cutting into squares with a hot knife. These babies will keep stored in an airtight container in the fridge for up to three days. But I’m guessing they won’t last you that long. This entry was posted in How-Tos and tagged domesticity, how to, Ready Made magazine by highplainsthrifter. Bookmark the permalink. 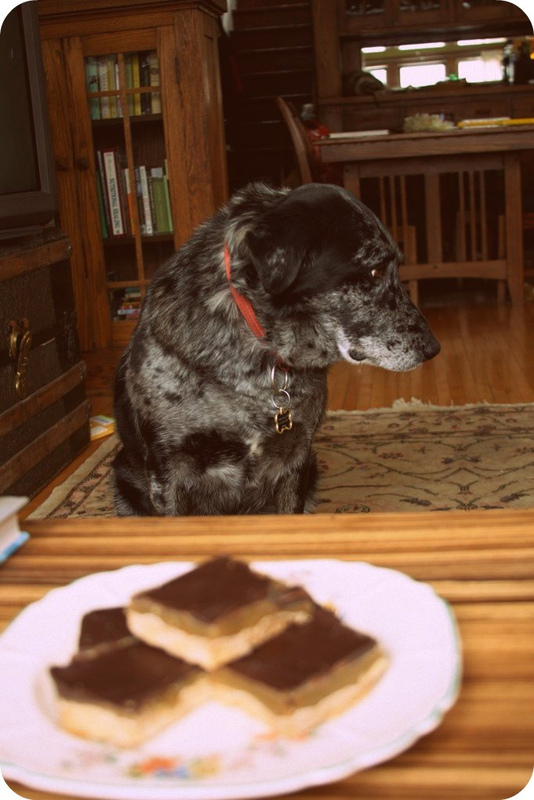 Love that good looking merle dog! I’ve been strangely obsessed with salted caramel lately. Can’t wait to try this recipe! They look amazing!